I haven’t been feeling well for a while. Mostly I’ve been really tired and have very low energy but I keep trying to make my goals for losing weight. I started using my stationary bike again and even though my goal is to make 10 minutes I sometimes don’t make it. I still do what I can and once or twice I made it to 15 minutes without too much pain. I have lost 6 lbs so far! Last year I was stuck at this one place and I am now past it! That right there makes me happy! I weigh less than I ever did last year. Not a lot less but any less is great! I have to work really hard to watch my diet. I’ve found that cutting back on carbs really helps but I also use a little protein supplement to make sure I get enough. That is one thing I usually run low on. I’m keeping my calories at 1200 and taking vitamins. I’m using myfitnesspal.com along with the app for the iphone to track what I eat. I also made a gift for a friend who is pregnant. She lost her first baby at birth and I can’t imagine going through that. My stomach was in knots just thinking about it. Well in my dishcloth group we were learning about intarsia, which is a method of adding colors. There was a knit pattern and a crochet pattern. I did the knit cloth and I wanted to learn the technique for crochet as well. I wasn’t loving the pattern though. It just wasn’t something that I wanted for my kitchen so I thought I’d just have to make it for someone else. Well, after I looked at the pattern I saw something else in it and decided to change the pattern. 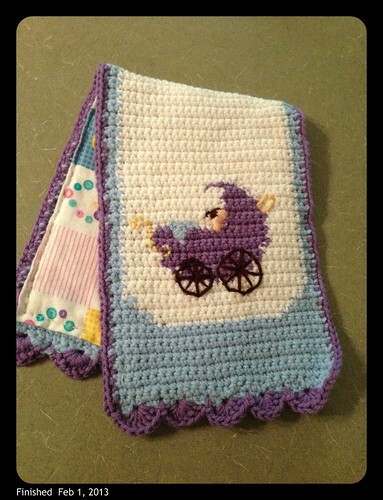 The pattern was on graph paper so I changed the design by omitting some squares and embroidery designs and adding my own until it looked like a baby carriage. I also got a piece of graph paper and scribbled in squares until I had a decent angel. 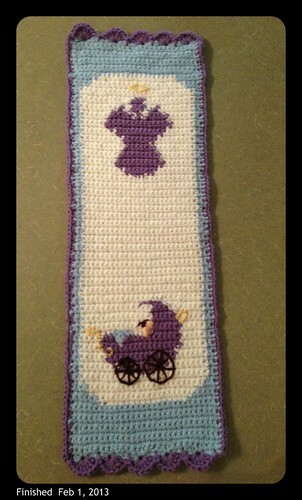 I made it a long rectangle with one design at each end and backed it with pre-shrunk flannel for a baby burp cloth. It is made out of materials that are easy to wash and dry. I was able to give it to my friend last night and she loved it. I decided to link this post up to a linky party hosted by Creative Crafts Thursday at www.creativecraftsthursday.blogspot.com. It’s a blog hop so click below to see the other blogs that are participating.